The Peerless temporary pressure control unit is a Variable Frequency Drive-based motor control that incorporates a standby generator and an automatic transfer switch. When clients are trying to maintain system pressure while a storage tank is down, we deliver a unit to their pump station and connect it to line power and motor leads. A pressure sensor is then installed in the piping. We dial in the system pressure, ensuring hassle- and worry-free pressure, even without overhead storage. 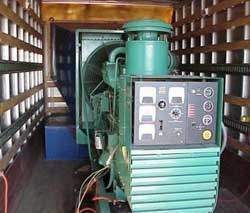 If a power failure occurs, the standby generator kicks in to assure uninterrupted service. The Variable Frequency Drive adjusts the motor speed to maintain pressure regardless of flow. For the client, this translates to no more employee overtime to throttle a hydrant, no more pressure surges from sticking relief valves or no more short cycling with hydro-pneumatic tanks. Client operating costs will be significantly lower because the pump moves only as much water as is needed. If you think a water tower inspection or tower maintenance may be in your company’s future, contact Peerless-Midwest to learn if Portable Pressure by Peerless is the solution for you.